Posted on July 25, 2010 by Russell . Ubuntu Bangladesh was formed in 28th April 2006, more than 4 years ago with the vision to create a solid platform for Ubuntu users and contributors in Bangladesh. 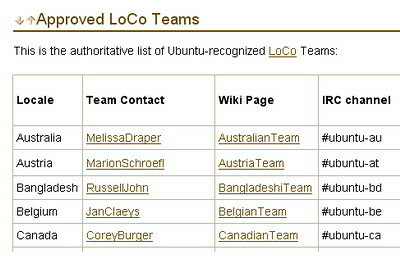 We’re the official local community team in Bangladesh, recognised by Ubuntu Community Council and Ubuntu’s sponsor Canonical Ltd. It’s been a long journey, and I’m really glad that with all of your help, support, and contributions we’ve been able to achieve most of our major goals. I’ve been working as the team leader of Ubuntu Bangladesh throughout these years, and I’ve decided to step down and hand over the team leadership to two of our very active volunteers, Shahriar Tariq and Shabab Mustafa. They have made a tremendous contribution for our team, for Ubuntu, and for Linux as a whole, and I strongly believe that Ubuntu Bangladesh will prosper even more under their new leadership and vision. I’ll still be around, will help to administer our Launchpad page, mailing list, IRC channel, and our site. Thanks to each and everyone who’ve helped me throughout the years, thank you for your never-ending support! Long live Linux, long live Ubuntu! Posted on April 29, 2007 by Russell . I’m very happy to announce that Ubuntu Bangladesh finally got the “official” status. This news couldn’t come on a better day as we’re celebrating our first birthday today! Thanks to Jono Bacon and everyone at the Community Committee for approving. I’m hoping for some great days ahead of us. Wish us luck! Posted on January 22, 2007 by Russell . It is my pleasure to announce the official Ubuntu Bangladeshi mirror at http://bd.releases.ubuntu.com — now on a new server with a larger hard drive! Our sincere thanks to BDCOM Online Limited for sponsoring the server and the bandwidth. Please share the link with your friends, and download the latest ISOs faster than ever! Don’t forget to harness the power of jigdo and torrent files as well! Posted on August 16, 2006 by Russell . I finally finished working on my first “complete” Bengali site. Check it out and let me know what you guys think about it. I’m looking for criticisms, so please be honest and let me know the truth. The site has been tested to work under Ubuntu, Kubuntu, Fedora, Mandriva, OpenSUSE, and Windows, with Firefox, Konqueror, and IE. Posted on June 1, 2006 by Russell . Ubuntu 6.06 (Dapper Drake) was released today, making it the perfect day to announce the new home of Ubuntu Bangladesh. I’ve been working on-and-off on the site for the last few days, tried MediaWiki, MoinMoin and TikiWiki, but finally decided to go for PHP-Nuke, which is not a wiki but a CMS. The site is happily running from an US server, hosted by our sponsor Dualnic. Check it out! 23 queries in 0.386 seconds!